American DJ Jelly Cosmos Ball DJParts - All Variety of Parts that DJ Needs. The ADJ Jelly Cosmos Ball is art of the popular Jelly Series. It features dual rotating balls that produce multi-colored, sharp beams of light. The transparent balls glow creating an exciting effect on their own. This effect is powered by four 3-Watt, 3-in-1 RGB TRI Color LEDs. The fixture has a variable speed adjustment knob to change the speed of rotation. The ADJ Jelly Cosmos Ball offers a new twist on an old school lighting effect and brings pure lighting excitement to any party. 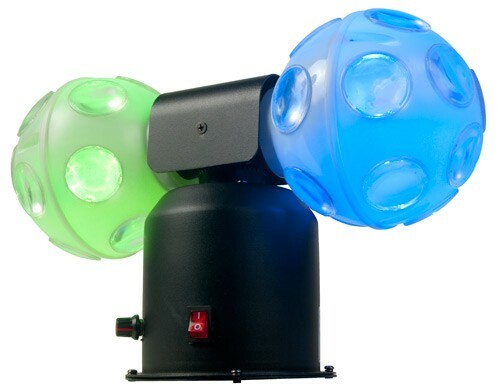 Specifications: • Easy-to-use dual rotating balls produce multi-colored beams • Sound Active • 2-FX-IN-1: Glowing transparent case + sharp RGB beams of light • 4 x 3-watt 3-in-1 RGB “TRI Color” LEDs produce a variety of color effects • Variable speed knob to adjust • Beam Angle: 360 degrees • Run all night – no duty cycle • Power consumption: 18.4W • Long life LEDs ((Rated at approximately 50,000 hr.) • Rotation: Variable up to 35 RPM • Multi-voltage operation: AC 100V-240V 50/60Hz • Dimensions (LxWxH): 13.5” x 5.5” x 10” / 337.9 x 134 x 254mm • Weight: 5 lbs. / 2 kg.